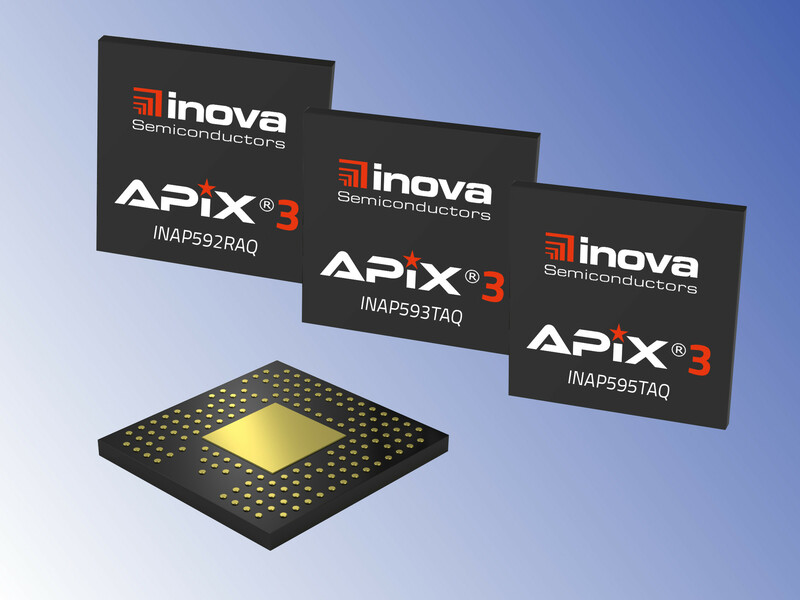 Munich, 08 November 2018 – Inova Semiconductors now launched the first members of the new APIX3 generation – two transmitters and a receiver. 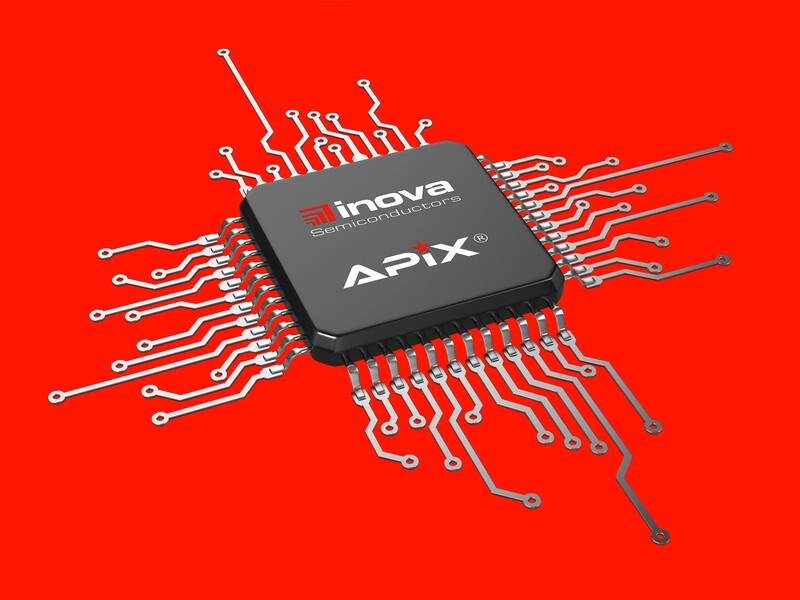 APIX (Automotive Pixel Link) is a multi-channel SerDes (serialiser/deserialiser) technology developed by Inova for high-resolution video applications in motor vehicles, especially in the growing segments of infotainment and advanced driver assistance systems (ADAS). The latest-generation APIX3 can host multiple display connections with bandwidths of up to 12 Gbps and supports HD and Ultra HD displays. The first members of the new APIX3 family include the transmitters INAP563TAQ with HDMI 1.4a (with 3D support) and INAP565TAQ with DSI 1.2 and the receiver INAP562RAQ with CSI, DSI or LVDS video output. The two transmitters differ only in the video input and are otherwise compatible. Each of these transmitters can use the INAP562R receiver to set up an APIX3 link via a QTP, STP or coaxial cable. The components support various EMC-friendly operating modes with fixed bandwidths of 1.5; 3 or 6 Gbps in single-lane mode or 3, 6 or 12 Gbps in dual-lane mode with a fixed back channel of 187.5 Mbps. The new devices of the APIX3 family are designed for popular displays (e.g. 2880 x 1080 x 24 bit, 60 Hz) in cars. But also video resolutions up to Ultra High Definition (UHD) and colour depths up to 30 bit are possible. The INAP565TAQ with DSI interface also allows the transmission of DSC compressed video data with a future-proof available video bandwidth of up to 28.8 Gbps. All the devices enable the simultaneous transmission of up to eight audio channels. A special feature of the APIX technology is the media-independent interface (MII, RMII, RGMII) for 100 Mbit Ethernet according to the IEEE standard. An SPI interface for convenient component configuration and data transfer is also available. The receiver INAP562R also has an I²C interface, which is optimised for the connection of touch screen controllers. The two new APIX3 transmitters and the new receiver are available now. All the devices are qualified to AEC-Q100 and operate in a wide temperature range from -40 °C to +105 °C. Inova supplies the transmitters in a 151-pin and the receiver in a 162-pin aQFN package. The APIX3 technology has also been licensed to Socionext.